Yossi Klein Halevi comes to Duke! 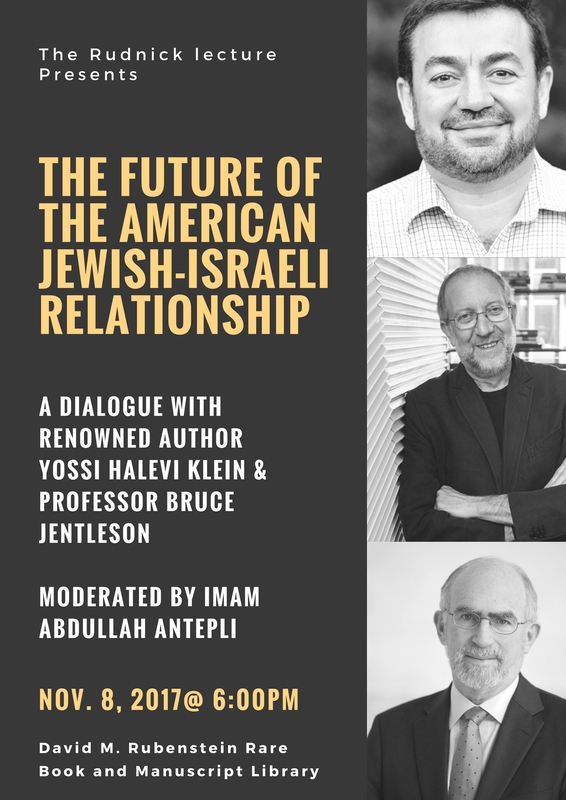 Prizewinning Israeli author Yossi Klein Halevi will discuss the future relationship between American Jews and Israel, Wednesday, Nov. 8, at Duke University. The talk begins at 6 p.m. in the David M. Rubenstein Rare Book and Manuscript Library on West Campus, and is free and open to the public. Parking is available in the Bryan Center garage and lot. Imam Abdullah Antepli, chief representative of Muslim affairs at Duke, will moderate the discussion with Halevi and Bruce Jentleson, a professor of political science and public policy. Yossi Klein Halevi is a senior fellow at the Shalom Hartman Institute, a Jerusalem-based research institute and educational center. Together with Imam Antepli, he co-directs the Institute's Muslim Leadership Initiative (MLI), which teaches emerging young Muslim American leaders about Judaism, Jewish identity and Israel. His 2013 book, Like Dreamers: The Story of the Israeli Paratroopers Who Reunited Jerusalem and Divided a Nation, won the Jewish Book Council's Everett Book of the Year Award. In the book, Halevi interweaves the stories of a group of 1967 paratroopers who reunited Jerusalem, tracing the history of Israel and the divergent ideologies shaping it from the Six-Day War to the present. Like Dreamers was published in Hebrew in Israel in 2017 for the 50th anniversary of the war. His new book, Letters to My Palestinian Neighbor, will be published by Harper Collins in June 2018. He writes for leading op-ed pages in the United States, including The New York Times, the Los Angeles Times, and the Wall Street Journal. His first book, Memoirs of a Jewish Extremist, was published in 1995. In it, he tells of his youthful attraction to, and subsequent break with, the militant Rabbi Meir Kahane. In 2001 he published At the Entrance to the Garden of Eden: A Jew's Search for God with Christians and Muslims in the Holy Land. The book tells of his spiritual journey as a religious Jew into the worlds of Christianity and Islam in Israel. This event is made possible by the Rudnick Lecture Endowment. For more information, visit http://jewishstudies.duke.edu.